Paula Shoyer, aka The Kosher Baker, center, one of the Susie Fishbein and Friends Culinary Institute instructors, surrounded by some of her students, including Ayla Wrubel of Watchung, far right, and Sara Getraer of Highland Park, third from left. 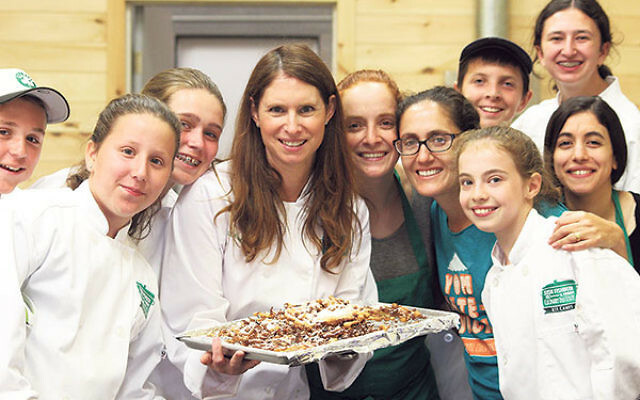 This summer, New Jersey Y Camps launched Susie Fishbein and Friends Culinary Institute. Campers had a choice of 14 sessions of cooking workshops, held in a brand-new, state-of-the-art kitchen located at the border between Camps Shoshanim and Nesher, the Orthodox girls’ and coed camps, respectively. The kitchen was designed to specifications provided by Fishbein, author of the “Kosher by Design” series of cookbooks and a Livingston resident.